When you start with a good base, taking a recipe like risotto to the next level couldn’t be easier. By adding pureed asparagus with the chopped spear heads sends this dish into the stratosphere!. Asparagus in an ancient vegetable that was lauded during the greek and roman eras but fell from grace until the 1400’s. Today, it’s considered one of those vegetables, like brussel sprouts, that people generally don’t like. I was one of ‘those people’ but this recipe changed all that and it was this dish that convinced me that I can love asparagus! Steam the asparagus in a double-boiler, cut into one-inch pieces and sprinkle with fresh squeezed lemon juice. Puree a bit more than half of the asparagus with a tablespoon of olive oil and stock. Keep the spear-heads aside for adding near the end of the process. 2. Add the Arborio rice and mix well until all grains are coated with the oil. Mix while cooking until the grains begin toast slightly. 3. Add 1 cup of white wine and mix well. Keep mixing until the liquid is absorbed by the rice before adding more liquid. 4. Following the same procedure, add 1 cup of heated stock, always mixing, and wait for the rice to absorb before adding another cup of heated stock. Reserve the last cup of stock until the end! 5. 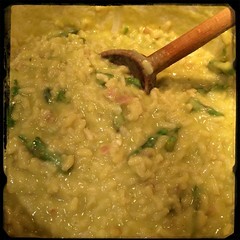 Once the risotto has absorbed most of the liquid, add the butter, mix well and let it melt. 6. Add the Pecorino Romano cheese, a bit of salt and white pepper, mix well and let cook (while mixing) for a couple of minutes. 7. Add the asparagus puree mixing well allowing it to cook for a few more minutes. 8. Add the last cup of stock continuing to mix well and let cook until the liquid is absorbed and the risotto is the consistency of your liking. 9. Finally, fold the chopped up asparagus spear heads into the risotto and about 2 tbsp of fresh squeezed lemon juice, now you’re ready to serve. Garnish with fresh chopped flat-leaf parsley.